I grew up just outside of Philadelphia and was diagnosed with cystic fibrosis before I was born after my older brother, Will’s, diagnosis. I am a recent graduate of Fordham University and I live in New York City with my rescue dog, Boo Radley (named after a character from my favorite book, To Kill a Mockingbird). I am a singer, actor and model and also work as a cystic fibrosis and patient advocate. I founded a nonprofit called Singing at the Top of My Lungs to use my voice to raise awareness and fund cystic fibrosis research. 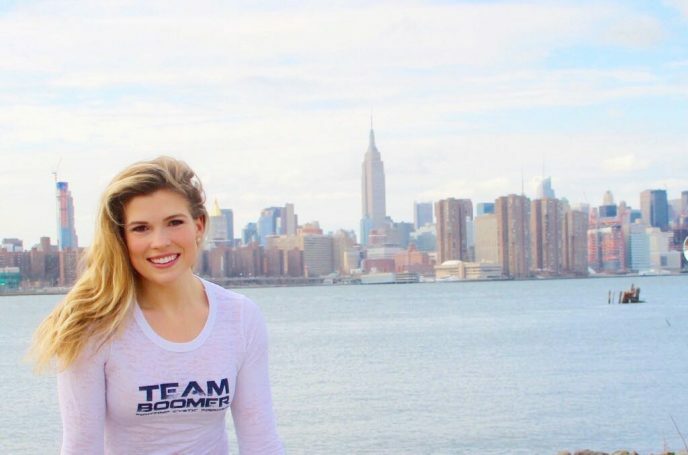 I am currently training for the NY marathon with Team Boomer. I was 16 the first time I ever spoke publicly about cystic fibrosis at a fundraiser. After my speech, the mom of a five year-old girl with cystic fibrosis came up to me and thanked me for sharing my story because it gave her hope. That was the moment I knew I would not stop using my voice for CF until it was not needed anymore. I still keep in touch with that family today. Parents of young CF patients not only inspire me because I want them to be able to watch their children grow up and live full, healthy lives, but hearing from them reminds me of the sacrifices and commitments my parents made to get me to where I am today. These two things combined make for one heck of a motivator! If you had asked me this time last year if I would ever run a half marathon, I probably would have laughed. I am certainly not a natural born runner. But I decided to push myself and give it a go for Team Boomer at the Rutgers Half Marathon this past April. My two older brothers have always been my best friends and greatest supporters. I was getting pretty nervous about making it 13.1 miles on my own and they decided to sign up at the last minute and run the race with me. I don’t know that I would have crossed the finish line without them, and my favorite memory is crossing it with them. Free therapy — for my lungs and my mind. You can never go wrong with Michael Jackson’s “The Way You Make Me Feel” but right now I can’t get enough of “Don’t Be So Hard on Yourself” by Jess Glynne. Start where you are. Starting is the hardest part, which is why focusing on “little wins” is important. Give yourself credit for all the progress you make and keep going. Surprise yourself!